In case you haven’t noticed, I am quite picky about the food that I post onto my blog. It doesn’t have to be my favorite item of all time (although several of my recipes are), but it does have to live up to a certain standard. I love to rely on my crock pot when I have a busy day. I am always playing with recipes and trying to adapt them for the crock pot. Some work and others just don’t live up to my high expectations. I recently found a website for crock pot recipes and tried one that seemed promising only to be disappointed in the end. I hardly ever settle for “ok” with a recipe even when using a crock pot. I told you I have high standards. With those standards in mind, I am happy to share this recipe with you. 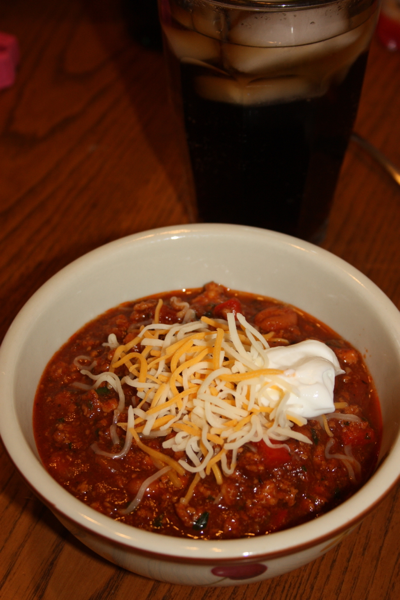 I have shared before how I love chili and how Jeffrey and I had to compromise to find a chili that we could both enjoy (We enjoy beef chili, white chili and even lentil chili). Well I have added another chili recipe to the mix! 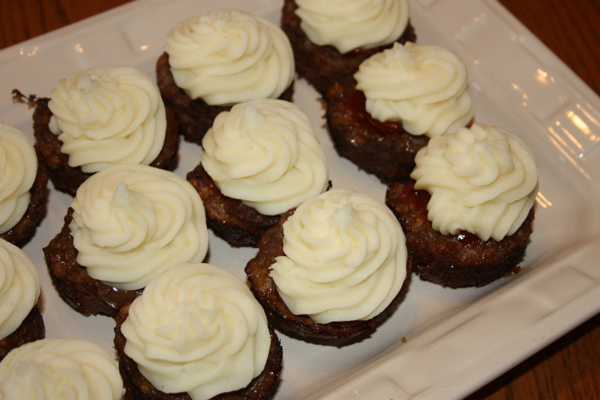 I found this recipe from The American Test Kitchen’s Family Cookbook and it is a winner! There is a lot of prep work, but it could easily be done the evening or day ahead so that you could quickly throw this in the crock pot before heading out for the day. Although if you are just working at home and need an easily meal that cooks while you tend to other things you, will enjoy the aroma as this one cooks. YUMMY! 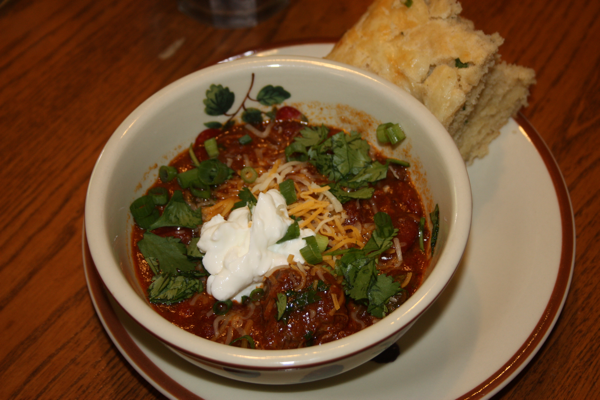 The flavor in the chili is layered and the addition of the lime juice and cilantro at the end really add to the dish. The flavors are complex and very pleasing. This result is what I look for when I use my crock pot. I don’t want to settle for something to eat. I want food that tastes good and has some complexity and this definitely fits the bill. As an added bonus, both kids ate this without complaining and even complimented the dish telling me how delicious it was. I can’t wait to find more yummy crock-pot meals to share with you. Cook the bacon pieces in a large skillet over medium heat until crisp, about 8 minutes. Remove bacon from the skillet and place it in the crock pot. Reserve the bacon fat for browning the meat. Pat the beef dry with paper towels, then season with salt and pepper. Add the meat to the skillet with the bacon fat. Cook until the beef is browned on all sides, about 10 minutes. Remove the browned beef from the skillet and add it to the crock pot. Add the onion, jalapenos, chili powder, cumin, and 1/8 teaspoon salt to the same skillet used to cook the bacon and beef. Cook until the onion softens, about 5 minutes. Stir in the garlic and cook about 15 seconds until fragrant. Add the crushed tomatoes and scrape the bottom of the pan to loosen up any browned bits. Bring to a simmer, then pour into the crock pot. Combine the torn tortillas in a large measuring cup with 1 cup of chicken broth. Microwave on high for 2 minutes. Pulse in a blender, food processor, or with an immersion blender to puree the chicken broth and tortilla mixture. Stir pureed mixture into the crock pot. Add the remaining cup of chicken broth, chipotle pepper, and sugar to the crock pot. Cover and cook on high for 6-7 hours or low for 9-10 hours or until the meat is tender. Stir in the beans during the last hour of cooking. When ready to serve stir in the chopped cilantro and lime juice. Season with salt and pepper. Serve with sour cream, more cilantro, green onions, and shredded cheese. 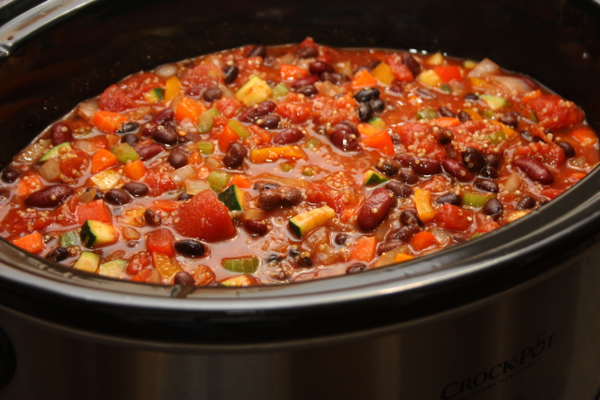 *This recipe can easily be doubled and cooked in an oval sized crock pot. **To prep the day before, follow the recipe above with the following exception. Do not combine the meat and bacon with the liquid ingredients. Store them separately over night in the refrigerator. 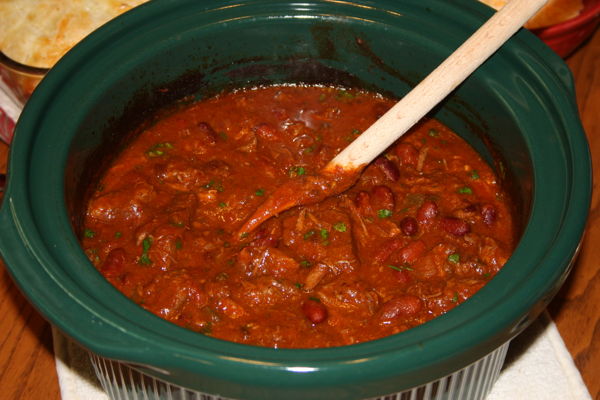 In the morning, add the meat and the liquids together in the crock pot and turn on. It may take a little longer since all of the ingredients are going into the crock pot chilled. Add the beans about 1 hour before serving. Just before serving add cilantro and lime juice. One Comment on "Texas-Style Chili Con Carne"